To rationalise and streamline the College’s brand guidelines to allow for easy application across a wide range of materials and, at the same time, launch the new Master’s vision for the College. The concept for the guidelines is ‘three simple rules’… three logotypes, three colours, three typefaces, three graphic colour bars, and so on. 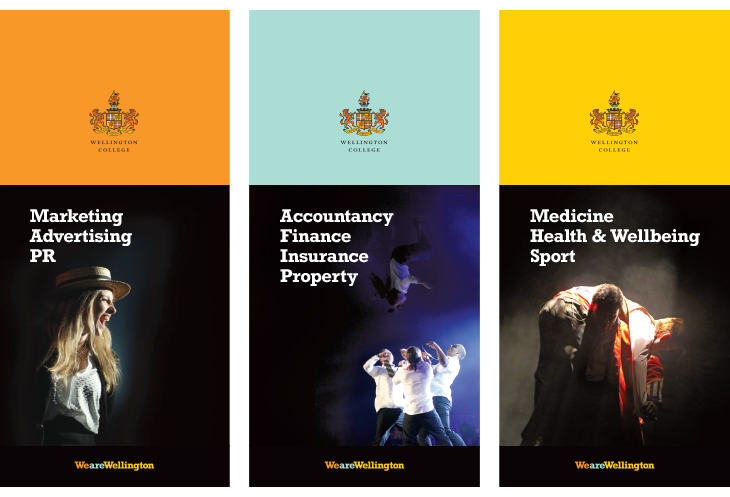 This concept follows on to the Master’s educational vision: the Wellington Identity with three simple words, ‘I am Wellington’, and is then further extended to the Community Office, ‘We are Wellington’. The brand guidelines work equally well for the College and their International School partners and the Wellington Identity came to life at the launch event held at the Natural History Museum. The event lighting reflected the brand guidelines to be uniquely Wellington. Hanging banners at the event encouraged visitors to get together and network with other members of the community.